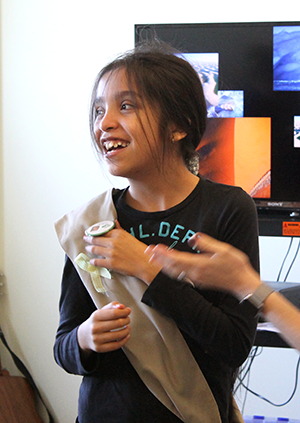 Joy is what you’ll find at the monthly meeting of Girl Scout troop 25226. 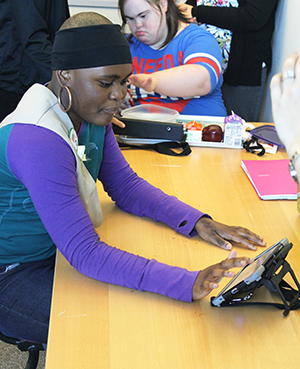 Held at Easterseals Academy, which serves families in the Rockford and Chicagoland area, the 13 girls in the troop are active “Daisies” – they sell cookies, learn the Girl Scout Promise and Law, and practice concepts like being honest and fair to make the world a better place. Their leader says the girls have a lot in common — they share interests, friendship and they also have Autism Spectrum Disorder. Because Autism Spectrum Disorder is 4 times more prevalent in boys than girls, sometimes it can be hard for the young women to find the community that is so important. As the troop members gathered around tables in a sunshine-filled room for their June meeting, they were quiet and reserved at first… until it came time to don their khaki-colored Girl Scout sashes. “Who wants to go first?” asked Browne. Excitement started to build, and soon, many of the girls eagerly dashed to the front of the room to put on the sash amid cheers and applause (pictured right). Once the sashes were handed out, the scouts then moved onto the iconic Girl Scout handshake. Pairing up with staff and each other, the girls all joined in shaking hands with their left hand and making the Girl Scout sign with their right (pictured below). According to the Girl Scouts, scouts shake hands with the left hand because it is closest to the heart and signifies friendship. The Easterseals Academy, like many affiliates across the country, offers recreational programs for its students outside of the classroom. With options like monthly meetings of karaoke club, sports club and Wii club, the staff works to provide the students with the social activities they may not otherwise have access to. During their June meeting, the troop learned about responsibility — working together to create a paper chain and discussing the overall concept to complete the badge. To make the chain, each scout was given a task, from passing out the paper, to cutting the paper into stripes, to attaching the “links.” Everyone was responsible for a piece of the fun. While activities like making the paper chain teach core concepts like responsibility, they also work in conjunction with many of the girls’ Individualized Education Programs (IEP). 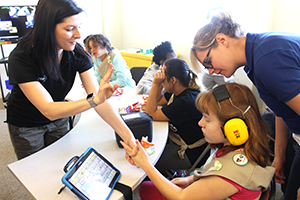 With the support of the troop leaders, all of whom are also Easterseals staff members including occupational therapists, speech language pathologists, social workers, teachers, and paraprofessionals, the Girl Scouts troop lets the girls socialize while also working toward their goals. At the end of the day, when the cookies have been sold and the badges earned, what remains is friendship and inclusion, and what could be more amazing than that? Receive inspiring stories, news and helpful resources about Autism Spectrum Disorder through our Autism & You eNewsletter. Sign up now!